Who pays when startup employees keep their equity? As has been much discussed, stock options as used today are not a practical or reliable way of compensating employees of fast growing startups. With an often high strike price, a large tax burden on execution due to AMT, and a 90 day execution window after leaving the company many share options are left unexecuted. There have been a variety of proposed modifications to how equity is distributed to address these issues for individual employees. However, there hasn't been much discussion of how these modifications will change overall ownership dynamics of startups. In this post we'll dive into the situation as it stands today where there is very near 100% equity loss when employees leave companies pre-exit and then we'll look at what would happen if there were instead a 0% loss rate. What we'll see is that employees gain nearly 3-fold, while both founders and investors – particularly early investors – get diluted. There is a small invariable loss, about 5%, to employees who are, incidentally or otherwise, at the company at the time of the exit. At epoch (year 0) the founders own 1M shares, 100%, of the company. At the end of year one 50,000 shares (5%) are created for employees, 100,000 shares (10%) are created for investors. Etc. However as employees leave their shares get recycled or effectively nullified. A spreadsheet laying out the math and it's consequences is available on Google Sheets. You can copy it to alter the conditions in Cells P2:Q6. Those cells also have notes documenting the meaning of each parameter. 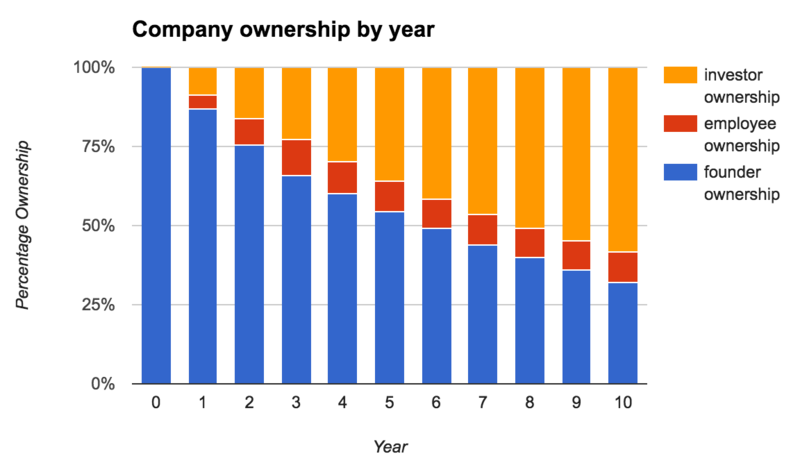 So what does this look like plotted out as percentage ownership in the company? 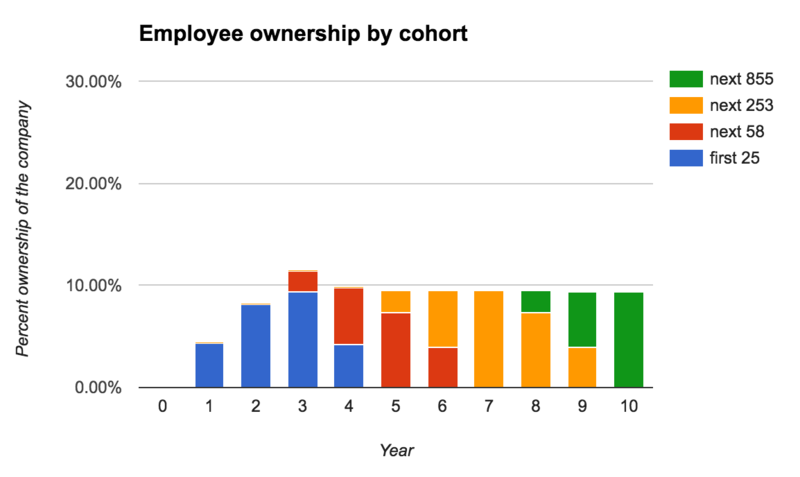 As you can see the 10% for investors really adds up but the ownership block for employees has an upper bound. You can also see that only the employees hired in year 8, 9, 10 (the final 855) have any shares at the end of year 10. Quite bizarre! Who pays for this? 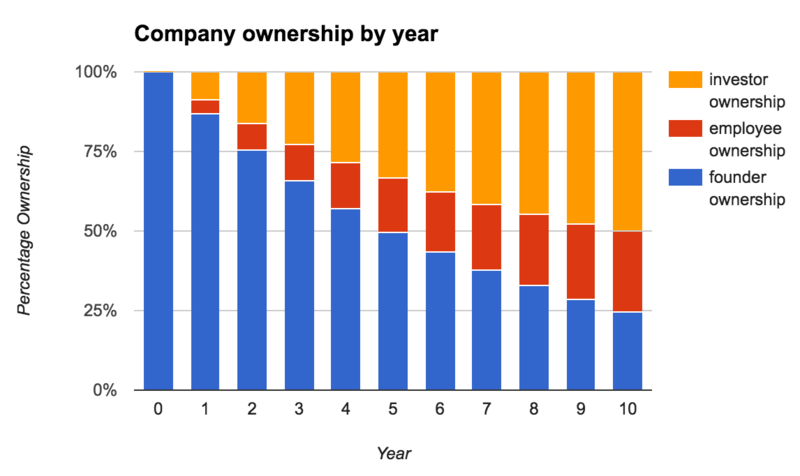 Primarily founders who take a 25% hit after 10 years going from 33% ownership to 25% ownership, secondarily investors who take a 15% decrease from 58% to 50%. The cost to these parties is 5x and 3x respectively compared to the potential cost to employees at the company at the time of the exit. Within the investor class the earlier investors lose more. Year one investors go from 3.2% to 2.3% about a 25% loss, pretty much the same as founders. Year ten investors go from 9.0% to 8.7% about a 3.5% hit. The first 25 employees retain 3.9%, the next 58 employees 3.9%, the next 253 8.4%, and the final 855 8.9%. Much more sane! Use single-trigger RSUs  right from the beginning. Full stop. The only valid circumstance for stock options for employees is 83b'd early exercised options when the strike price is a rounding error, i.e. no money has been raised. If your company already has a significant investment in stock option grants then think creatively about ways that you can extend the execution window – ideally indefinitely – or convert options to single-trigger RSUs. If you already have the low option execution rate baked into your long term planning then you will need to figure out how to communicate that to your employees. Assumption of a 15% round every 18 months = 10%/year. It is quite likely that stock options as a mechanism worked much better when the average time to IPO was shorter. According to a16z the median time to IPO has increased from 4 years to 10 years. Importantly, this is invariant to the annual employee equity creation rate. You can play around with values in cells Q3 and Q4 to see this. What is a single-trigger RSU? It is an RSU that doesn't settle – i.e. convert to stock or cash which you are then taxed on – until another condition is met, typically that there is a liquidity event such as an IPO. Double-trigger RSUs have an additional condition on them, usually that you must also be an employee of the company which clearly defeats the point. See also Startup RSUs - What you need to know. Settlement triggers are independent of the more well known acceleration triggers. Only an issue at the later stages of companies (note: this writeup argues RSUs "from the beginning"). Only if you are exercising later in the company stage, when the fair market value has (usually) gone up. If you are bullish on the company, it's generally best to exercise as you vest, for this very reason. Also, exercising as you vest gets the timer going for (a) cap gains treatment (much better tax rates), AND, a possible Qualified Small Business Stock tax exclusion (5yr holding, significant tax break). and a 90 day execution window after leaving the company many share options are left unexecuted. This is MUCH less of an issue if you are exercising as you go along (see above). If you you have just left a large unicorn private company, there are often secondary buyers for the stock. You could exercise and sell some stock to them to cover your exercise cost. Regarding RSUs, you HAVE TO PAY TAX AS YOU VEST. For a private company, you're just replacing one potential problem (AMT with option exercises) with a very specific actual problem (steady tax liability as without liquidity). RSUs are a very useful compensation tool, but you can't declare them unilaterally better. ALL equity compensation forms require some "user sophistication", including options and RSUs. If you don't understand how to optimize your situation, get advice from someone who does! We only care about the case where the company is successful. Companies that are not successful should be cheap to invest in but suffer from a different problem. If you have raised money and your strike price is still a rounding error – i.e. 1-5% costs less than a paycheck – then great, 83b the heck out of it! For many companies that is not the case. There is a default (unilateral) approach right now which is not employee-friendly. Lets work together to change that. Fighting amongst ourselves only works against our interests. This is a great idea in theory, but isn't really the case in practice. Secondary buyers are probably some of the shadiest people in the tech industry right now (and that says a lot), and once they hone in on the fact that you have a 90 day window, they go for blood. It's likely that you'll give up the majority of your stock to cover the taxes + the exercise + the vultures, which puts you pretty close to being in the same boat as just throwing it all away anyway. This is especially true in today's market, where, in the words of these buyers themselves, "there's basically an unlimited amount of locked-in unicorn employees looking to sell, and an extremely small amount of people are looking to buy". I've thought a lot about this, and I agree that the current incentive paradigm is dubious. Ultimately, I think the industry depends on employees being ignorant of how securities work. People take bad deals all the time, forgoing cash salary for a lottery ticket that would only make sense in the best-best-0.00001-case scenario. For example, if an angel investor pays $100K, they'll get Preferred Stock with great features like liquidation preference. But if an employee takes a $100K salary cut over two years, the deal wouldn't be close even though the cash value is similar. Stocks were meant to be a liquid asset, but the restricted terms common in SV often include liquidity preference/ROFR/Cosale/NDA clauses that are intentionally cryptic and designed to make the security illiquid. If professionals really wanted to be taken seriously, we should organize and collectively bargain for a standardized set of terms that are more favorable and less cryptic. Single-trigger RSU's seem interesting, but I don't see the status-quo changing when it's working so well for investors. Do you have any ideas for how a change like this could actually be implemented and become common? That's my point: your comment "use single trigger RSUs right from the beginning. Full stop." -- it's not good advice. Even after the company has raised money, stock options are often much better for employees (especially on a post-tax basis). Also, you have to look at things after-tax. Single-trigger RSUs don't vest until a liquidity event so there is no tax hit. Single-trigger RSUs accelerate on a change of control (vs "double-trigger" which typically requires change of control AND change in position or termination of employment). And, an IPO (a "liquidity event") may not necessarily trigger anything with an RSU, it depends on the company. And upon vesting, RSUs are considered income and are taxable. Options at the early & mid-stages of the company are often more employee-friendly than RSUs. That's why companies tend to start there, then switch to RSUs later. Finally, I hope you find the feedback helpful. I completely support equity compensations structures that work for everyone, and for employees especially, mechanisms that offer the best after-tax upside. But any discussion will be hindered if folks don't first understand how existing things work. The premise is that no one can afford options in a high growth successful startup – as @holman spoke about eloquently above. Tax treatment of the stock you don't buy doesn't need to be factored in. @jdmaturen Thank you so much for writing this! This makes it very clear that the additional hit (5%) to other employees caused by extending exercise windows is relatively small, compared to the upside and fairness of letting people keep their equity. It is definitely a much more fair computation than the one done by a16z, where they limit the size of the option pool, and claim that it drastically squeezes newer employees. Could better secondary markets be the solution for employees stuck with a 90 day exercise window? @holman @payne92 I've heard that the terms of the deal from some secondary buyers e.g. ESOFund, are rather unfriendly e.g. 1x or 2x liquidation preference, taking 30-50% of the upside, 5-10% annual interest, and are generally very loan-sharky. So why is there so little discussion or public cases of this? I cannot find any information on people who actually have sold on the secondary market, especially using the newer deal structures. It seems like a panacea for anyone with a 90-day exercise window. This is especially true in today's market, where, in the words of these buyers themselves, "there's basically an unlimited amount of locked-in unicorn employees looking to sell, and an extremely small amount of people are looking to buy". It seems that one major reason the market is so bad for the sellers, is that it is so shady-seeming and opaque. I imagine that given even just a 10% discount on any given "unicorn" startup, there would be a huge amount of angels jumping to invest, but the world is intentionally dark and illiquid, since random engineers are much less knowledgeable and powerful than the investors and companies, who have an interest in not letting employees see this. Another reason is some companies try to restrict anything involving shares-from Right of First Refusal, to an outright prohibition of any loan/sale/_ without board approval. This is common at nearly every unicorn startup it seems e.g. Uber . It seems that the majority now outright disallow share transfers without board approval. So the founders, for instance, could cash out tens of millions of dollars, but not let any of the employees get liquidity - since they want retention. And, in a really dark scenario, if the company wants some vested stock back, all they have to do is fire someone at year 4 before IPO, and watch that employee fail to afford the AMT, and then get all the stock back after 90 days. Some argue the outright transfer or "transfer-like contract" prohibition is unenforceable, but I haven't seen any case law. First-hand knowledge online is scarce and lawyers give unclear answers due to the novelty of these deals. Can the company even find out if they aren't involved? Intervene? Sue? Are they likely to? Are we not going to find out until some brave employee does this and then we see a showdown of company C suing fired employee A for using secondary market B? What's the difference between self-funding vs. a rich relative vs. a rich friend who is an angel vs. their group of angels vs. a marketplace investor? To put some more solid numbers onto this, the typical AMT tax hit for exercising options but not selling them is (28% federal + 7% California) * (current Fair Market Value of the stock - strike price) (there are various exemptions for AMT, but once you get into the higher range of stock values, it tends to wash out). Let's say you had joined Uber at the time their 409a valuation was $1 and received 50,000 ISOs. Since then, the 409a rose to $40. In order to exercise, you now owe (50,000 * 35% * $39) about $650,000 of Alternative Minimum Tax to keep your shares. I think one major factor in helping the situation at large is to simply educate offer takers, and make this more public. Before signing any offer, a prospective startup employee should read all these about startup equity, and compare the employee friendliness. Super-hidden and likely unenforceable terms about restricting any and all secondary transactions related to the stock ranging from collateralized loans to sales. Since secondary transactions can be used to escape the AMT trap, I'd really like to see more examples of what actually happens when people challenge these restrictions. Finally, what about tax law changes? To some, the other "bad guy" in the room is the IRS, who charges Alternative Minimum Tax on the phantom/paper gains. Unlike most other taxes, ISO holder lacks the real cash to pay for the tax, and some argue the AMT for ISOs should be eliminated entirely. In the wake of the first 1999-2000 stock runup, many employees got screwed with the AMT - and http://reformamt.org/ popped up to provide relief and lobbied Congress to provide a one-time AMT relief in tax years 2007-2012. Cynically, many will say employees are by far weaker than the companies and investors at lobbying Congress, and the latter have a reason to have employees locked-in to reduce their mobility, increase retention, and have leverage over them. I love that you are talking about this! I agree that the current set up is very unfriendly to non-founder employees. I'm trying to understand if single-trigger RSUs would really be better. I'm working through your assumptions and the main one that's causing concern relates to Constant annual equity creation rate for employees of 5%. I'm trying to understand its exogeneity. 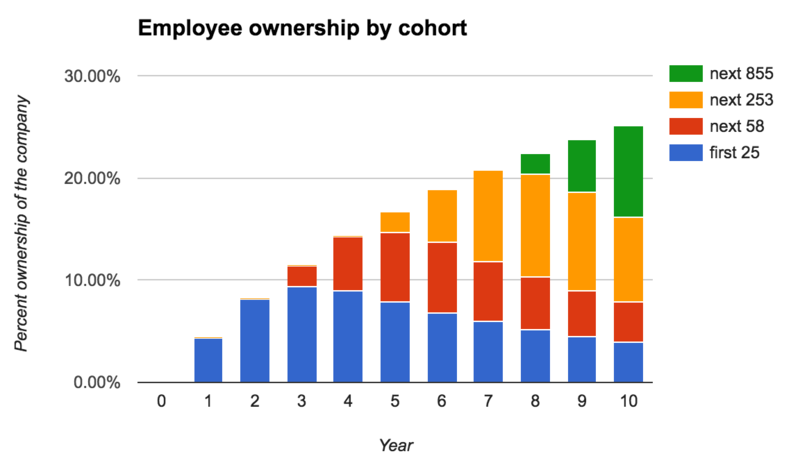 My contention being - if employees kept 100% of their options, the dynamics around employee pool creation would shift so much that the rest of the model wouldn't hold up. This variable is at the heart of it, right? To go from nearly 0% to 100% would fundamentally change the level of annual equity creation - without that high abandonment rate, early money (founders mainly) would need to change a lot (or investors would need to stop insisting that options come of out the pre-money). 7-year vesting (ala Pinterest) seems great on it's face. A 7 year (American) option inherently has more value than the standard 90 day option so I assume companies adopting this model will simply adjust by offering fewer options. So I guess I'm still unsure how that shakes out (in practice or in theory). Do you have any ideas for how a change like this could actually be implemented and become common? An excellent question @thesmart. Much to @qwyman's comments, I believe the first step is education and quite simply talking about it. Becoming literate, if you will. Investors in it for the long haul know that they must build relationships with future founders. Those future founders are today primarily (though certainly not solely) employees. That relationship is built on trust and belief in common principles. I believe as we get more people talking about this we will find more common ground. Hopefully through this process there will be a tipping point at which new, transparent equity practices become the expectation. Equity is of course one point amongst many. How do we address the shortcomings in hiring, review, overall compensation just to name a few areas of deficit? One way is taking an analytic lens to the problem. Sketch out the space, fill in assumptions, run simulations, do research, read research! @rishimkumar there are a few ways this can play out. My assumption is that founders who do this type of planning can make an informed decision about what they want to see in the world. That could mean that a company decides that 5% is too steep and perhaps 1.5% is more acceptable. Or that exponential growth (/ dilution) isn't in the cards and so the rate should decay over time. This could then be communicated to employees who could then together evaluate and discuss the implications. budget now for future N years with the understanding that you will need to be in the 2.5-5% range – or more likely the 10% range in the first year(s) – to be even remotely competitive. A 7 or 10 year window is certainly more valuable than a 90 day window, and in turn less valuable than an indefinite window. One could probably calculate the relative values of these types of shares. But the real lesson is that reasonable and planned dilution through the creation of new equity should itself be the mechanism of pricing in future value created by future employees. It seems improbable to me that at a fixed point in time in the the future the value of my contributions to the company will drop from something to nothing. So why is there so little discussion or public cases of this? I cannot find any information on people who actually have sold on the secondary market, especially using the newer deal structures. A large part of it is that some of these firms require an NDA on their terms and overall process. It's basically set up so you can't collude with other clients to argue for better terms. Along those lines: I had a five-day exploding offer — you have five days to make a decision or it's gone — from one of these firms sent to me a week before I needed to make a particular decision. The offer was sent on Saturday afternoon, so if I needed to talk to my accountant or lawyer it's basically been turned into a three-day exploding offer since it's not a work day. All these little sorts of things really get you, and they're exacerbated by the 90 day window and the fact that many companies will NDA you. I think one of those doesn't do forward contracts, but I can't recall specifically right now. In either case, this is another place where the 90 day window really wears you down; EquityZen and Equidate are more set up for arrangements where you aren't under the gun to find an offer (i.e. while you're still at the company and have more flexibility with your time). Places like ESO, though having onerous terms, are likely more reliable to close within 90 days. The core of this problem, IMHO, relies around an employee's ability to capture the value that they've earned. I think my contention is that a single-trigger RSU doesn't solve anything on it's own. Whatever expected value a single trigger or a restricted stock unit offers can be "made up" by either offering more or less of whichever you are choosing from. The reason a company adopts one or the other is mostly around the liquidity of it's stock and the most favorable tax treatment to itself and its employees. With the right provisions, they can be effectively equal in value from the employee's point of view. So it feels like the way to most effectively solve the problem with the least amount of assumptions to work would involve encouraging a healthier secondary market and encouraging a change in legislation (e.g., related to tax treatment). Back to first principles -> liquidity + transparency (in the pursuit of fair pricing) underpin a free market. Many of the downsides of encouraging more liquidity (e.g., needing accountants publishing public records w/ agency oversight) exist anyways (good luck trying to extend the IRS 90-day window without at least a 1-2 dedicated accountants). Whatever expected value a single trigger or a restricted stock unit offers can be "made up" by either offering more or less of whichever you are choosing from. It can only be made up in a way that promotes transparency and lack of surprise. Additionally I believe it is structurally more sound. The average expected value is certainly transmutable to single-trigger RSUs in the example case by offering ~1/3rd the amount of shares to employees. At the end you end up with 9.4% of the company in employee's hands either way. What would be gained though is that no employees would lose their shares under the best-possible-case scenario for the company. You side step having a vast swath of ex-employees being disgruntled and a portion of current employees working at your company for reasons other than it is a place to do great work. I believe maintaining the company's reputation (literally, doing what you say you're going to do) would be a net-benefit. It is possible that it is not feasible to reduce the grants by 2/3rd as you'd then be unable to hire anyone. Empirically it is already known that shares in an early startup have net zero value so this argument doesn't make much sense. Single-trigger RSUs alone are neither necessary nor sufficient to achieve transparency and forethought – and strictly speaking are not themselves the point of this post – but they are an off-the-shelf, well known and well understood mechanism that can be used today. One issue with them for employees is that provisions need to be made up front for the possibility of settlement during company-run secondary sales, etc. In practice that is often the only way to get liquidity with options anyway so that is not much different. Like many things it just needs to be thought about and accounted for beforehand. Maybe the real lesson here is precisely that lack of preparedness on companies behalf. All that said if there are achievable ways of meeting the same end that address the structural imbalance of information and power then I am all for it whatever the mechanism. Well, few months back when I checked for stock listed on U.S. exchanges, I found number of options to invest in. But the more choices I have, the harder it become for me to make a right decision. Thanks to the professionals of Pre IPO Pros who helped me out to pick one stock and make most out of it.